An essential everyday item for racers, pro-shops, scooter part shops, and riders! Below you will find the most complete offering of Mikuni jet sizes for your next scooter parts upgrade. Feel free to browse and select the right size for your Polini scooter performance project. 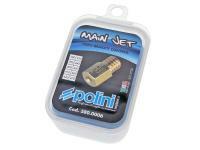 Polini main jet selection of different sizes that fits the Mikuni carburetor. 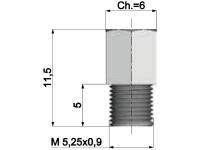 Please compare to your original jets prior to ordering to make sure you get the right Mikuni size. Polini S.p.A. is an Italian manufacturer of tuning parts for ATVs, motorcycles, mopeds, scooters, pocketbikes, and motor driven bikes. Among other products, they produce cylinders, jets, carbs, and variators for both racing and road use. 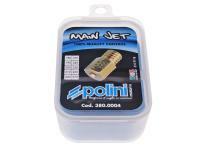 Racing Planet is proud to carry the scooter racing range of Polini products in our scooter parts shop. On our site you can find the greatest selection of the Italian brand. 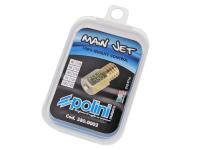 If you have any questions on Polini products feel free to open a support ticket and we will answer it as soon as possible. 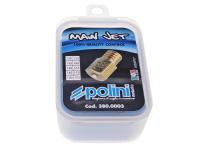 Racing Planet USA is your online source for Polini Racing Scooter Parts.